The following example shows four sections, all collapsed, in the course outline. 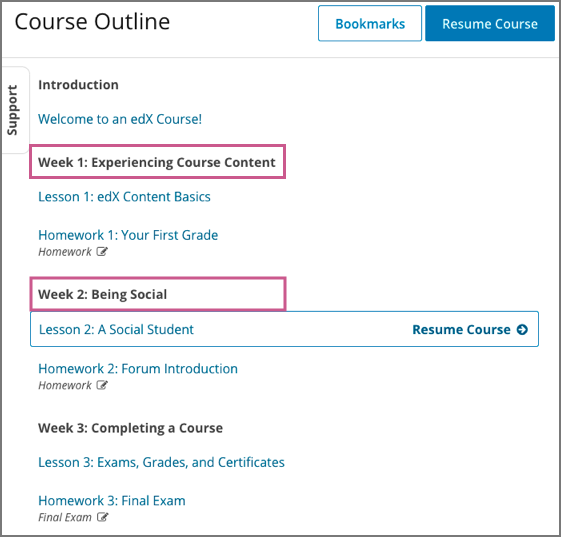 In the LMS, learners see section names in the course outline on the Course page, with subsections listed under the section name. Learners click subsection names to access the units in the selected subsection. In the following example, two section names are indicated with a box outline. On the Studio Course Outline page, each unscheduled section appears with a gray bar next to the section display name. The following example shows how a section that is scheduled for release displays in the outline, summarized with a green bar. On the Studio Course Outline page, each scheduled section appears with a green bar next to the section display name. On the Studio Course Outline page, each released section appears with a blue bar next to the section display name. On the Studio Course Outline page, each released section that has unpublished changes appears with a yellow bar next to the section display name. When you expand the section, the unit that has unpublished changes is visible. On the Studio Course Outline page, each section that includes a unit with staff only content appears with a black bar next to the section display name.